The concept of News Pond started evolving in 2001 whilst I was studying at University of Art and Design Media Lab Helsinki. I got a chance to build a realistic, running prototype based on this concept in 2003 when I continued my studies at Swinburne University Faculty of Design. The foundation of the original News Pond project can be summarised by two concepts: information visualisation and calm technology. Information visualisation is about abstracting data and expressing that abstraction in a visual format to aid comprehension. Introduced in 1996, calm technology is an attempt to lessen the obtrusiveness of contemporary digital environments. Most current digital systems are reactive, not proactive, and the user has to provide a stimulus to get a reasonable response from the system. For many purposes this engages the user unnecessarily. News Pond, and now Tweetpond, aim at giving users a gist of the recent updates at just a quick glance. 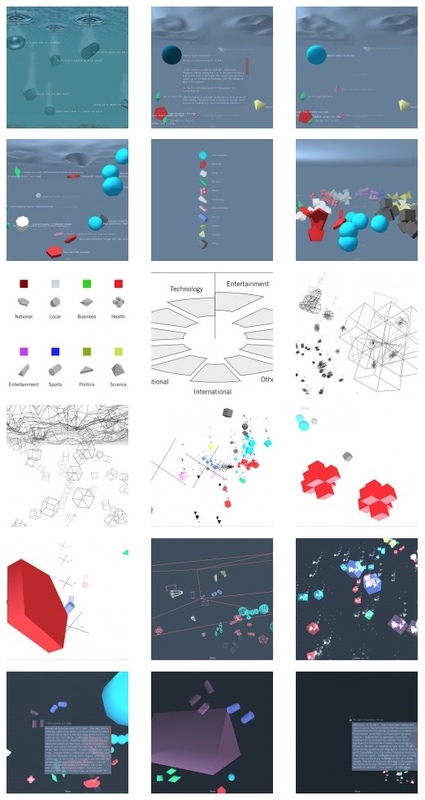 The inspiration for the News Pond visualisation comes from natural and physical phenomena such as water, rain, surfaces, gravity, friction, and inertia. The visualisation is based on the idea of water-like surface representing now, with news events falling through this surface “as things happen”. water ripples on the surface indicate the position of a recently downloaded news item. Ripples on the “water surface” are a core feature of News Pond and they were included already in the earliest concepts. Still, the ripples aren’t there for decorative purposes only; they are used to indicate the position of a recently downloaded news item. Early sketches of News Pond also included air bubbles emanating from the news items. These were evaluated further with the conclusion that they make the underwater metaphor too literal and hinder comprehension, and subsequently taken out. The basic object in the world of News Pond is the news item i.e. a reported news event. Each news item contains information such as publish time, headline, body, link and category. easy to tint with colour. The visualisation concept reserves the vertical dimension for displaying relative time i.e. the age of a news item. As the world of News Pond is three dimensional this still leaves two dimensions where news items can be freely positioned. Positioning objects randomly on this two-dimensional plane does not help users find news items of interest. Therefore news items are placed within segments of a “virtual cylinder”, depending on their category. Mouse controls are available to rotate the camera to view an interesting category. More advanced news sites provide links to related articles as support material for a new article; how could these relationships be shown visually? Could network, temporal or geographical distance between news events (or news providers) be used to enhance the visualisation? What would the interface be like if the user was wearing data gloves? How could one apply a visualisation like this to more volatile content such e-mail, instant messaging, or SMSes? Furthermore, could the product be modified to enable content creation in addition to pure content consumption? It’s the second last question I chose to tackle with Tweetpond. In building Tweetpond it was interesting to see how easy it was to adapt the News Pond concept from 2003 into the online environment of 2009. The core metaphor remains unchanged even when the application has been repurposed to visualise tweets instead of news headlines. Some of the News Pond’s original utility specifically around categorisation has been lost in Tweetpond but in my opinion this has been made up by the fact that the underlying information source – Twitter – is real-time by nature, and therefore lends itself to this type of visualisation even better than the original news headlines. Having said that Tweetpond is just an early experiment – a work in progress – and it could evolve to a number different directions in the future. What do you think? Do you feel Tweetpond is a worthy successor to News Pond? How would you like to see the Tweetpond concept evolve? Do you think there is a need for a modern-day News Pond, focusing specifically on news instead of Twitter updates? This post was originally published on the Tweetpond blog.